Following the purchase of your vehicle, we are pleased to welcome you to the Dealer Care Extended Guarantee. The Guarantee is administrated on behalf of the selling dealer by AA Warranty. Extended Guarantee – as well as explaining the things you must do to keep the Guarantee valid, such as having your vehicle correctly maintained and serviced. If you have any questions on the contents, please contact the selling dealer or our customer services team on 03300 555 242 who will be happy to help. What is the Dealer Care Extended Guarantee? of the selling dealer by AA Warranty, Warranty House, Savile Street East, Don Valley, Sheffield, S4 7UQ. What are your entitlements under the Dealer Care Extended Guarantee? Your vehicle will have undergone a pre delivery inspection to ensure it reaches you in the best possible condition, however no matter how well the vehicle is prepared, things can go wrong. The Dealer Care Extended Guarantee sets ut to protect you against the cost of repairs resulting from the failure of the components specifically listed in this document. The duration of the Guarantee and claim limit will be detailed on the schedule issued to you by the selling dealer. The definition of Mechanical Failure shall mean, the sudden failure of a component arising from any permanent mechanical or electrical defect, (for a reason other than wear and tear, normal deterioration or negligence). The Guarantee will not meet the cost of routine servicing and maintenance, adjustments or components failing as a result of normal wear and tear. dealer, please telephone AA Warranty on 03300 555 250 who will advise you of the correct procedure to follow. AA Warranty operates a nationwide network of nominated repairers who are fully conversant with our repair procedures and we reserve the right to use these repairers at our option to carry out repairs to your vehicle. No repairs may commence until authorised by AA Warranty and a claims authority number has been issued to you. No claim will be rejected on the grounds of wear and tear where the vehicle has covered less than 60,000 miles and is under 5 years old at the time of the claim. be required for validation purposes. If at any time you suspect you have a fault claimable under the Guarantee you should in the first instance contact the selling dealer to arrange for the vehicle to be examined. Alternatively, where it is not possible for you to return the vehicle to the selling dealer, please telephone AA Warranty on 03300555250 during office hours where you will be advised of the best course of action to take. Your call may be recorded for training purposes and your own security. No repairs may commence until approval has been given by AA Warranty. You must take all reasonable steps to avoid further damage occurring. The following information will be required: (Please have ready prior to telephoning). (a) Your name, the Guarantee number and vehicle registration number. with and original receipts are available. (c) Mileage at time of failure. Take your vehicle to the agreed repairer and obtain an estimate. The repairing garage must then telephone AA Warranty quoting the above Guarantee information and an exact cause of failure. The Guarantee holder must authorise the dismantling of any compo for inspection. Where the Claim falls under the Guarantee, this Guarantee will reimburse the Guarantee holder the cost of dismantling as p the total claim. (important – if after dismantling no liability has found the Guarantee holder must bear the cost of dismantlinq., the components specifically listed will be included under the Guarantee Labour will be allowed in accordance with the manufacturers s repair times. Diagnosis costs are the responsibility of the Guarantee holder. If the claim is accepted a Claims Authority Number will be issued specified agreed cost. Any costs in excess of this amount will remain Guarantee holder’s responsibility. should be made. Photocopied invoices will not be accepted. and the claim rendered null and void . AA Warranty on behalf of the selling dealer reserves the right to agree or nominate a repair Should the Guarantee holder elect to take the vehicle to a repairer other than that agreed or nominated, AA Warranty may accept the Guarantee holder’s choice, however the Guarantee The liability in this case, will not exceed the labour and components costs as charged by the nominated repairer. 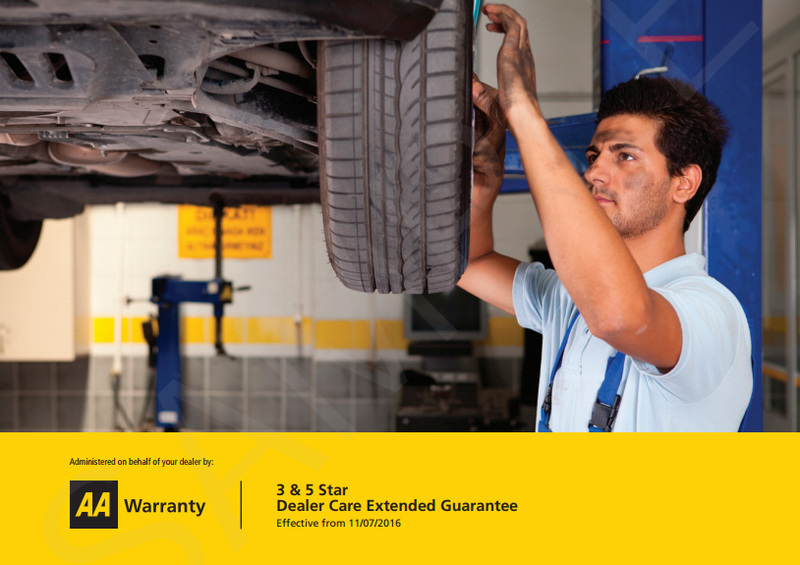 AA Warranty reserves the right to remove the vehicle to a repairer of their choosing. asked to pay a contribution towards the costs. Bodywork, paintwork, light units, interior and exterior trim, seats, glass (including mirror glass), handles, hinges and fasteners. Workshop consumables and service maintenance items which includes, but is not limited to; exhaust systems, spark plugs, glow plugs, filters, brake and clutch frictional material, wiper blades and arms, drive belts, pipes and hoses, bulbs, batteries and fuses. Any components listed as optional additional items unless detailed on the schedule. The following will only be included if selected by the selling dealer and listed as optional additional items on the Schedule. Excluding impact damage, corrosion or damage caused by the use of an incorrect grade or type of fuel, corrosion. Catalytic Converter with Diesel Particulate Filter (DPF) Excluding impact damage, corrosion or damage caused by the use of an incorrect grade or type of fuel, corrosion. Please note, the DPF is a serviceable item that requires regular regeneration. Please see the manufacturer owner's manual for details. Factory fitted convertible power roof motors, solenoids and control ECU. Manufacturer approved In car entertainment and technology packs In car entertainment systems including; screens, radlo. CD changer, TV, games console, iPad ! iPod connections Bluetooth wireless packs, satellite navigation systems, USB interface, on board computer, voice control, alarm fob, immobiliser, parking sensors and camera. In the event of a valid claim, where the repairs cannot be completed within 8 working hours, the Guarantee may contribute up to £50 inc VAT per day towards the cost of hiring a replacement vehicle. Replacement vehicle hire is limited to a maximum of 7 days for anyone claim. The first 24 hours of any rental period or delays resulting from the non-availability of parts are excluded. Guarantee will pay up to £50 inc. VAT. towards the cost of recovering it to a repairing garage. Limit as stated on the Schedule. Please make sure you provide bona fide receipts so that these costs can be reimbursed. claims under this Guarantee is limited to the retail value of the vehicle. shaft, rockers, hydraulic lifters, camshaft and cam followers, push rods, camshaft bearings, inlet and exhaust valves (excluding exhaust gas recirculation valve), valve springs, valve guides, cylinder head gasket, inlet manifold, timing gears, timing chains, timing belt/chain tensioner, flywheel or flex plate, starter ring gear. (Excluding: de-coking, burnt, pitted and sticking valves). Release thrust bearing, centre plate (oil contamination - centre plate only), pressure plate and slave cylinder. Transfer Box (4x4) Internal mechanical Components comprising of: transfer gears, selectors, shafts, transfer shafts, needle and roller bearings, output shafts, bushes. Front Wheel Drive & Rear Wheel Drive Drive shafts, universal joints and couplings, constant velocity joints, half shafts and bearings. (Excluding: gaiters and bushes). Props haft, universal joints and couplings, bearings, includes front and rear transfer shafts 4X4 vehicles. (Excluding: gaiters). Front and rear wheel bearings. Steering and Suspension Steering rack, box and column, idler box, coil springs. (Excluding: gaiters, oil leaks, tracking and balancing). Brake master cylinder, calipers, wheel cylinders, brake biasirestrictor valve. (Excluding: wiring and connection faults). Alternator, starter motor and solenoid front and rear windscreen wiper motor, front and rear windscreen washer motor, ignition coil and horn. Turbocharger I Supercharger I Kompressor The complete unit including the wastegate is included, providing it was supplied as part of the manufacturer's original equipment. Included in the event of a sudden failure (except where the failure is due to wear and tear). If the timing belt has been changed in accordance with the time I mileage requirements specified by the manufacturer (receipt required) it will be included in the event of a sudden failure. Should the failure of a covered Component result in damage to any associated casing the replacement will constitute part of the claim within the Claims Limit(s). Where an authorised repair requires the replacement or topping up of oils, antifreeze or other fluids, or replacement of the oil filter, these costs will be accepted as part of the claim within the Claims Limit(s). Manufacturer supplied and fitted power generation and transmission components are covered (excluding: batteries, wiring, electrical connectors and the disposal of chemical waste resulting from a claim). If the vehicle is not being used for a pro-longed period, it must be stored in accordance with the manufacturer's recommendations. Labour times that can be claimed under the Guarantee will be in according with the manufacturers standard repair times the rates charged by our nominated repairers unless agreed beforehand. We may ask the repairer to use guaranteed exchange units or factor parts when repairing your vehicle. Any costs we will be based on the prices for these parts. The Guarantee is a contract of compensation which means that if the repairs Your Vehicle result in the condition of Your Vehicle being better than irnrnedia prior to the Breakdown, You may be asked to pay a contribution towards costs. For any of the following services please contact Us on 03300 555 250 for authorisation. In the event of a valid claim, where the repairs cannot be completed within 8 working hours, the Guarantee may contribute up to £50 inc VAT per day towards the cost of hiring a replacement vehicle. Replacement vehicle hire is limited to a maximum of 7 days for anyone claim. The first 24 hours of any rental period or delays resultinq from the non-availability of parts are excluded. In the event of a Failure resulting in a valid claim and when Your Vehicle is immobile (or if continued driving could cause danger or further damage) the Guarantee will pay up to £50 inc. VAT. towards the cost of recovering it to a repairing garage.Important Replacement vehicle hire, hotel accommodation and rail fare expenses will constitute part of the total claim and costs will be limited to the maximum Claims Limit as stated on the Schedule. Please make sure you provide bona fide receipts so that these costs can be reimbursed. Manufacturer supplied and fitted power generation and transmission components are included (excluding: batteries, wiring, electrical connectors and the disposal of chemical waste resulting from a claim). If the vehicle is not being used for a prolonged period, it must be stored in accordance with the manufacturer's recommendations. door mirror motors and switches. optional additional items on the Schedule. grade or type of fuel, corrosion. Please note, the DPF is a serviceable item that requires regular regeneration. Please see the manufacturer owner's manual for details. In car entertainment systems including; screens, radio, CD changer, TV, games console, iPad I iPod connections Bluetooth wireless packs, satellite navigation systems, USB interface, on board computer, voice control, alarm fob I immobiliser, parking camera.